I’ve taken a bit of a hiatus from blogging only to return with a vengeance. That’s right, I engaged in a bit of multimedia tomfoolery to properly tell the epic tale of my Lasik surgery experience. I’m not gonna lie, and you will surely see: I’m a really, really bad videographer. Also not so great with putting the whole thing together, but it all seemed like a great idea at the time. My dad actually shot most of the still photos in the piece, and I’ve gotta give credit where credit is due. He took the really stellar opening shot. Granted, I set the aperture, shutter speed and iso, pre-focused and handed him the camera, but still- way to go Dad. Now, onto the surgery. I wasn’t nervous at all. I’d been determined to do something about my eyes since they started going when I was eight. The fact that I ended up as a photographer and in the words of one of my eye doctors a “super-seer” didn’t deter me at all. I never really saw in sharp focus. Up until now, my focusing skills have been a combination of good autofocus technology and guesswork. I wasn’t worried about going blind and I consulted many sources of information before deciding on TLC and Lasik. Dr. Whitten, the gentleman who performed Lasik on Tiger Woods (I make reference to this fact in the middle of the video when I’m stoned on Vicodin) zapped my eyes and sent me on my way. The surgery itself took about ten minutes total. Strange sensations but not much in the way of pain. The pain came later. It felt like someone scratched the hell out of my eyes for 3 or 4 days. All I could do was sleep it off. It’s been exactly 3 weeks since the surgery at the time of writing and my vision seems to get better with each passing day. I do have halos around light sources, which is irritating at night but I’m either getting used to them or they’re getting better. I’m not sure which. The haze I talk about in the end of the video is mostly gone. I have eye dryness issues, but it’s not terrible. I carry around eye drops and give them a drink every few hours. I should be 100% at around 3 months. Posted on 04/15/2010 12/12/2013 by Melissa Golden. This entry was posted in Multimedia, Personal, Personal Project and tagged lasik, Multimedia, Personal, surgery. Bookmark the permalink. 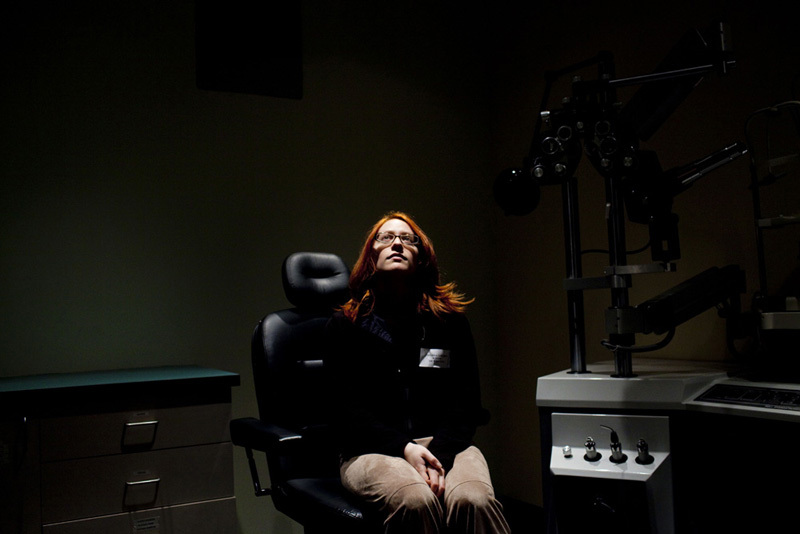 My Lasik Diary from Melissa Golden on Vimeo. You should be able to cut and paste the embed code right into the html tab when you do a new post. i gotta know: are those suede pants?! Hi Melissa, I’m a freelance tog based in London, I had LASIK a month ago, in fact I have my one month post-op visit tomorrow. Sadly I didn’t document it as eloquently as yourself but I got a funny picture and did a quick blogspot that you can see here (http://bit.ly/9HhZjT) if you’re interested. All the best with the recovery. Chris and Paul: I tried putting the embed code in the html tab, but when I published it, no video. I checked back and the html code disappeared entirely. WoooOOOoooo. Weird internets! Meredith: Yes. I only ever wear suede pants. Greg: I totally wear my eye shields at night like in your picture! I took a picture, but it was beyond dorky (even worse than me in a surgical cap) so I didn’t include it in the show. I’m not sure how long I’m supposed to wear them but I tend to roll over onto my face when I sleep so I think I’ll keep taping them on each night until the doctor says it’s ok to stop. The worst is peeling the tape off in the morning. Ouch. I check up on what new with you and I can truly say, I’M A FAN!!! !